You are currently browsing the tag archive for the ‘our official site’ tag. Do you live in or near Massachusetts? Have an adorable baby? And are pretty photogenic yourself (or have a friend who is)? Mothers and fathers both welcomed! Who says slings are just for women? Across this country and around the world, fathers carry their children too. In this Men In Slings column, we’re featuring an interview with one of our customers from Chicago–Allan with his adorably handsome son—shown here in our gorgeous, but no longer available Green Tea sling from the Artisan Collection. How did you discover baby slings? I discovered them through my wife. She is very proactive at finding the best parenting practices. What experiences has carrying your child let you have that you would’ve missed out on otherwise? Also, almost every Saturday (when its nice outside), my son will take his nap while I’m carrying him on a walk with my wife. As he sleeps, he will intermittently give me hugs and squeezes, and it makes me feel like the happiest father in the world. Have you convinced any of your friends to use slings with their babies? By practice and through conversation I think I have convinced several of my friends and family members that “baby-wearing” is a clearly superior alternative to strollers. Slings are particularly wonderful for infants, and I have some long-time friends who live in Texas who decided to use a sling after they stayed with us for a weekend before their child was born. I think that once you’ve been around a family who integrates baby-wearing into their everyday life, it would be difficult to rationalize not using a sling or at least some kind of baby carrier. What is your Sakura Bloom sling of choice? Anything double layer. I trust my wife to make the pattern choice! Yes–using a sling has been particularly important in the formation of a healthy, deep bond between myself and my adopted son. We’re in the process of adopting a little girl and plan on using slings again when we bring our daughter home. There really is no substitute for closeness in the parent-child relationship, and using a sling makes achieving this ideal accessible and convenient. People often assume that its just women who use baby slings, but no. Slings are for fathers, too. 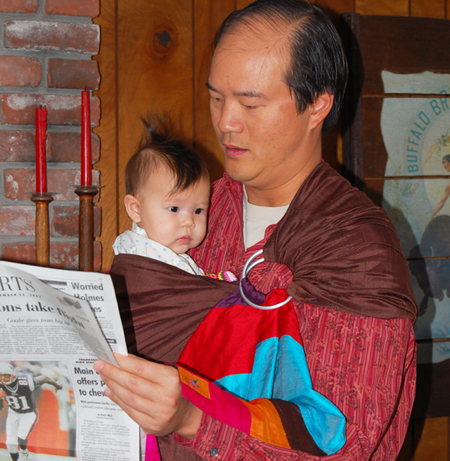 So, starting this week, we’ll be showcasing fathers carrying their children in Sakura Bloom slings. Dads who use slings will tell you that they can be like magic: soothing an unhappy child, perfect for nap time, and fun for a walk. 10. Walk around Home Depot. 9. Play Tiger Woods ’08. 8. Watch the Red Sox. 3. Read the sports page. 2. Play at the park with your toddler. 1. Cuddle with your baby. Happy Mother’s Day from Sakura Bloom! In honor of Mother’s Day, one lucky Sakura Bloom customer will win an entire suite of Sakura Bloom slings! That’s right, an entire suite of slings! one tussah silk Luxe sling. This is an $874-1160 value depending on which slings you choose! Simply purchase a sling from any Sakura Bloom vendor between today, April 1 and May 11 and you will be entered in the contest. Read here about our last winner, here about the current contest, and best of luck to everyone! Sakura Bloom at MOM2B in Las Vegas! Starting tomorrow, Lynne and Eric from Sakura Bloom Baby Carriers will be at the Mom2B trade show in Las Vegas showing the entire SB collection! The new Pure Collection. The cross-over Hana Collection. Our unbelievably soft Belgian linens in both solids, the Simple Collection, and two-color reversibles, the Essential Collection. And our silks, oh, our silks. The original dupioni Silk Essential slings. Our signature Artisan slings. And, the exclusive wild silks of our Luxe Collection. Going to the show? Be sure to stop by the Sakura Bloom booth to say hello and try on one of our slings. The world’s finest baby slings—-there’s nothing else out there like them! We had a wonderful time at last January’s Mom2B show in L.A. (that’s us at the L.A. show above) and look forward to seeing you in Vegas! The two slings that probably get the most wear time in my wardrobe are wildly different: the colorful Sakura Bloom Stripe silk sling and the simple Midnight linen sling. The Midnight is my Little Black Sling. Perfect with just about anything. Disappears when you want it to over blacks, provides a striking contrast over other colors, and always, always looks classy and comfortable. In two layers of the softest Belgian linen you can imagine. I can’t imagine being without it. But….if I had to give up my beloved Midnight linen, here’s what I’d replace it with: one of the sassy dupioni trimmed linen slings from our Hana collection—black with violet, black with ginger, or black with periwinkle. Or, if I’m allowed to dream, Moondance! Its not black, but its colors are beyond belief and close enough for me! New Colors in our Luxe Collection! We’ve just added three new colors to our amazing Luxe Collection of baby slings. The I’m-dreaming-of-a-Caribbean-vacation Belize, the deep, mysterious blue of our Lapis sling, and the frosty perfection of our Glacier sling. Each of these colors is just stunning in our tussah silk. The depth of the weave accentuates each of the hues as if were invented for the first time today. Simply gorgeous. Complexly simple. Simply Sakura Bloom!